Please read through all of the information carefully. All of the above documents should be carefully reviewed as they contain very important information for your upcoming season! Never cheered before? No worries…we love to train from the very beginning so your child grows up loving cheer the way we do! You hire our award-winning staff to teach you all that you need to know to be a successful and competitive all-star cheerleader. We promise you’ll have an amazing experience. 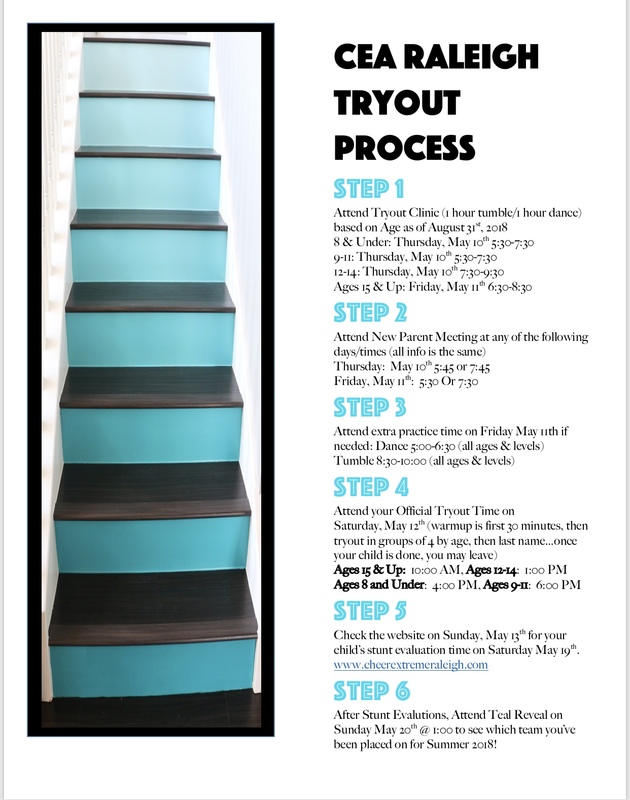 Once these tryouts have been completed, there is a separate to become part of our competitive program since our Full Year and Half Year cheerleading programs have choreographed routines that they compete through out the year. Send an email to cearaleighcullen@gmail.com to schedule an Official Evaluation and Gym Tour with one of our All Star Cheerleading Coaches. Following the evaluation, we will let you know of available spots in our program and what further steps need to be taken. Please check the two team box on your Information Card if you wish to be considered for two teams. Crossover considerations are ultimately selected by the coaching staff. **SKILLS CAMPS ARE MANDATORY in order to keep your spot on the team. Welcoming you to the Teal Family! Athletes must attend the mandatory tryout clinic times below according to their age as of August 31, 2018. They will be learning a four (4) 8-count dance. There is a separate dance for kids 11 & Under. Tumbling instruction will be geared towards preparing their tryout passes (both standing & running). Each group will briefly warm-up tumbling, jumps and choreography when they first arrive. Tryouts will occur in groups of 4, grouped together first by age and then last name. They will demonstrate a running pass first, a second pass if desired, standing tumbling, standing tumbling connected to a toe touch, Hurdler Double Toe Touch Jump Combination, the dance choreo and body positions on the floor. Please remind your child to smile & perform (and wear a bow . Bases and back spots will be asked what positions they prefer. The more positions mastered, the more chances they have to make a desired team. STUNT EVALUATIONS FOR ALL ATHLETES WILL BE HELD SATURDAY MAY 19th. Each group will briefly warm up tumbling, jumps, and the dance they learned when they first arrive. Tryouts will occur in groups of 4, grouped together first by age and then by last name. They will demonstrate first a running tumbling pass, a second running pass if desired, standing tumbling, jumps to a standing tumbling pass, a jump combination by itself, the dance choreography that was taught, and will finish by showcasing body positions for potential flying positions. Athletes must wear athletic style clothing, tennis shoes or cheerleading shoes, and a high ponytail (bow if available). ** Team placements on initial team rosters are not finalized until August. Athletes who do not keep skills performed at tryouts may be moved to a different team and/or become an alternate for that team. Those athletes who showed marked improvement through out the summer qualify to be moved up a level as well. The same rules apply throughout the official competitive season and also for post-season. Rosters are open to change throughout the season as athletes grow out of or into stunt positions. We are not known for leaving it up to luck when taking the stage to perform. It is the coaches’ job to put the best athletes out on the mat. Athletes must also show consistent attendance and a good attitude throughout the summer in order to keep their spot. Athletes must be hitting full out routines 2 weeks prior to a competition in order to solidify their spot on the competition floor. **Everyone who attends tryouts at Cheer Extreme makes a team. However, it may be suggested that our half-year program is a better fit for some athletes who have no prior cheerleading experience and need another year of intensive learning. Half-year tryouts are typically the last Thursday in August and the official season begins in September. You may pre-register at the front desk beginning Monday, April 9th with Allison. There will be a $5.00 discount if you pre-register by Thursday, April 26th. The registration fee must be paid by cash or check/money order made payable to CEA. Credit card payments will not be accepted. The USASF was created in 2002 to unify the all-star cheer industry with a specific set of rules. Divisions are governed by age. Your child’s age on August 31st of this year will determine his/her competition age for the season and tryout time. Birth certificates and photographs are required if we do not have one on file. Teams are formed by both age and level. Half Year Teams: Travel locally, compete at the beginner level and do not attend skills camp. Season runs from September 1st through mid-April. Pre-registration for the Half Year Program begins August 1st. Fees and uniform price are significantly less than full-year athletes. Full Year Program: Teams attend approximately 10 competitions each year between October and early May. Typically, 4-5 competitions are local (<1.5 hours away), 3-4 are driveable (<5 hours away), 1-3 may require a flight. Level 5 teams travel more extensively than other levels. Levels 1-4 & Restricted 5: Teams travel less extensively, go to a mandatory skills camp, & have the ability to obtain a bid to The Summit which is held in Florida at the end of April. If your athlete is on a team that attends The Summit, there will be additional expenses. Level 5: Teams travel extensively & go to a mandatory skills camp. If your athlete is on a team that attends Worlds in April there will be additional expenses. We are happy to announce that two of our 3 Worlds Teams from Raleigh will be attending the 2017 World Championship on a Full Paid Bid. 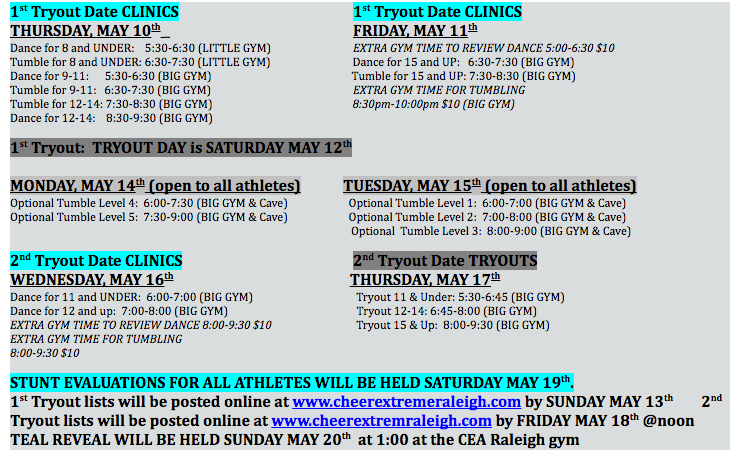 **When you join CEA, you are joining the program, not a specific team. Team placements on initial team rosters are set for choreography purposes by August 2018. Athletes who do not keep skills performed at tryouts may be moved to a different team and/or become an alternate for that team. Those athletes who showed marked improvement may be moved up as well. These same rules apply throughout the season and for post season. Rosters are open to change throughout the season as athletes grow out of or into stunt positions…ultimately it is up to Kelly to compete a team that has shown consistency in the gym before taking the mat. We aren’t known for leaving anything up to luck when taking the floor. Athletes must also show consistent attendance and a good attitude throughout the summer in order to keep their spot. Athletes must be hitting full out routines 2 weeks prior to a competition in order to solidify their spot on the competition floor. Please keep in mind that once a routine is learned, only a very unique body can fulfill the expectations of what was created. A quitter’s fee will apply to those who leave after choreo. 1- Electronic Payments: All monthly tuition paid to CEA Raleigh for all-star cheerleading will be done electronically on the 1st business day of every month through a bank draft. NO EXCEPTIONS! 2- 2018-2019 All-Star Cheerleading Pricing: The all-star program is offered as a 12- month program with payments due monthly from May 2018 through April 2019. **Crossovers pay separately for each competition they attend; however, they only pay once for choreography/music/coaches’ travel/banquet. They will pay the amount for the team with the highest fee for each**. Your child will not compete unless all fees have been paid. Competition Crossover Fees: Range from $150-$250 and will be due March 15, 2019. NSF: CEA Raleigh transacts business with its bank and on-line merchant processors and will pass along any NSF fees. The fee will be $20.00 per occurrence. 5- Termination: Membership to the all-star cheerleading program may be terminated at any time with a 30-day written notice or email before February 1, 2019to Allison Klinedinst, directly. All fees will continue to be drafted during the 30-day period. 6- Refunds: There are no refunds of competition fees or registration fees to anyone who leaves the program regardless of the date of leaving the program. Anyone who leaves or is dismissed is responsible for payment of final month and all outstanding debts. Please refer to terms & conditions for reasons an athlete can be dismissed. Jewelry is not allowed at practice or at competition; please refrain from having your child get a new piercing during competition season. Your child’s hair color must stay a natural color throughout the competition season. No blues/purples/pinks/other exotic colors will be allowed on stage. No extra undergarments are allowed under your skirt (Nike pros, spandex). 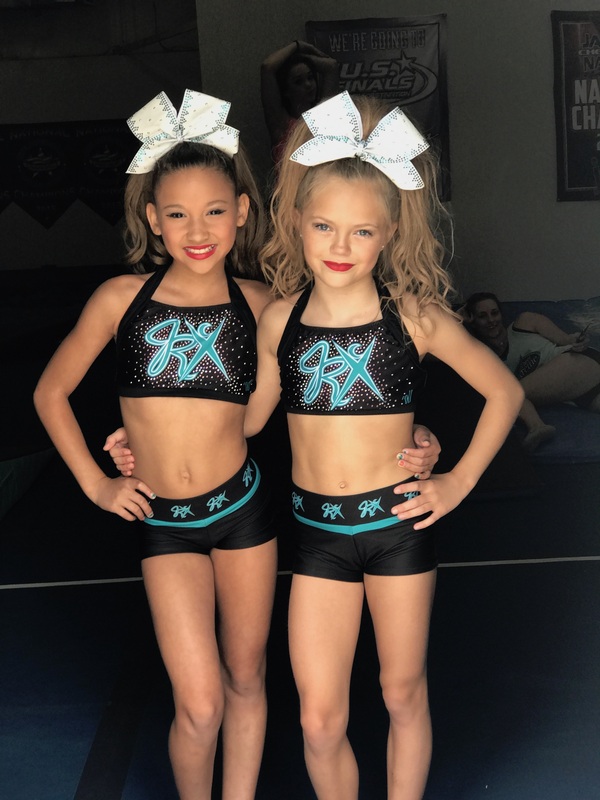 Each athlete wearing a crop top uniform is mandated by the USASF to have a cover-up while walking around the competition. There are two jacket options offered on the apparel sheet. You are charged $10.00 per unexcused absence. The fill in “hired” for the job is responsible for teaching all that they missed. Excused absences must be known 2 weeks prior to the absence and must be accompanied by a documented absence form available at the front desk. A child with a sickness/injury on the day of a practice must come to the next practice with a doctor’s note for it to be excused. Death in the family and family emergencies are obviously excused.